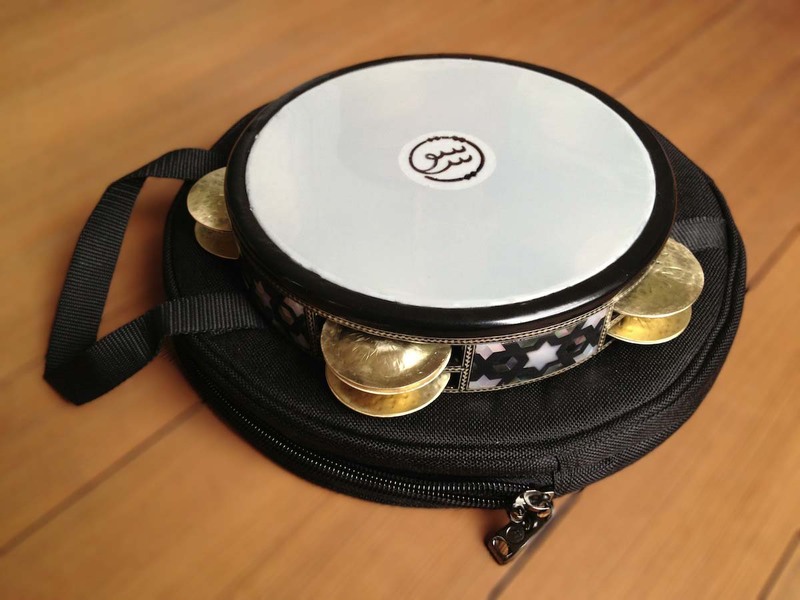 It features a ten point internal tuning system (see below) with a solid steel tuning ring. This tuning system allows for tuning changes over a wide range. 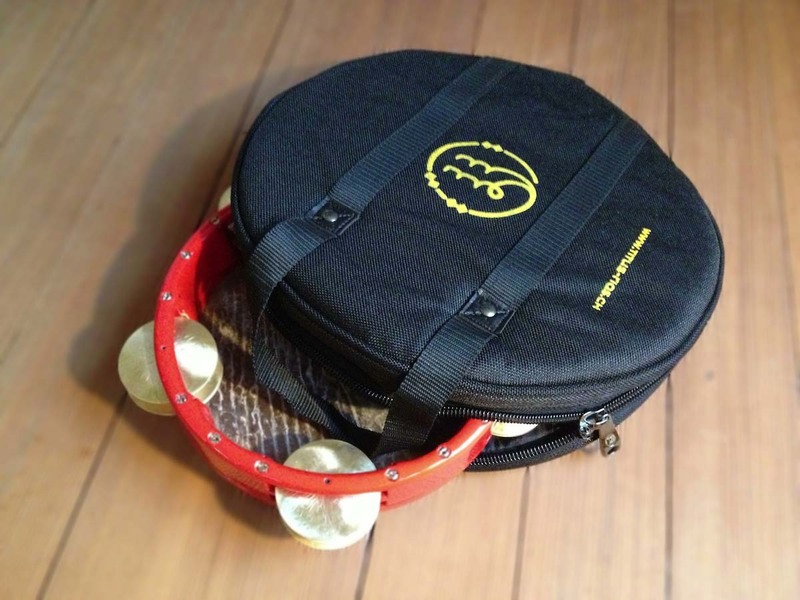 The heads can be changed - this is new to drums with this kind of tuning system. 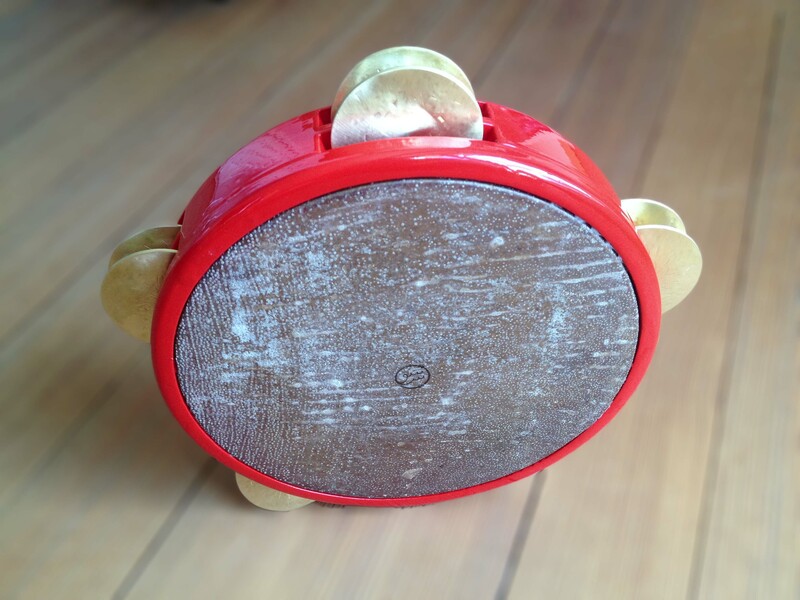 Usually you have to send the drum back to the manufacturer if you want a different skin or broke one. Not on titus-riqs modern classic : when you want to get a natural skin later, you can just exchange it for your original plastic one (or vice versa). The heads are held to the body by 15 evenly distributed screws. The outer edge of the skin ring is rounded for comfortable playing but the skin itself runs sharply (at a 90° angle) over the edge of the tuning ring like on a traditional sharp edged drum. 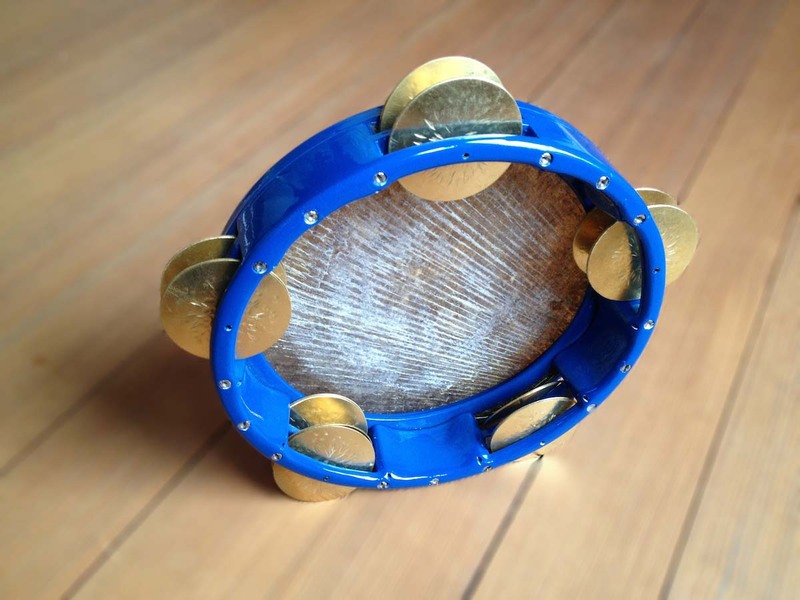 This provides a traditional sound as well as a modern look and comfortable playing. See the cross section picture below for illustration (pictured is a shallow model but the system is identical). The jingles - of course they are all hand hammered - can be changed or removed individually. Please go to the facebook page to see a movie demonstration how the head changing works and for more movies and images. on request you can get a 48mm shallow frame with much the same features like the modern classic model. When you have small hands and cannot handle the classic size or you want something lighter this might be an option. 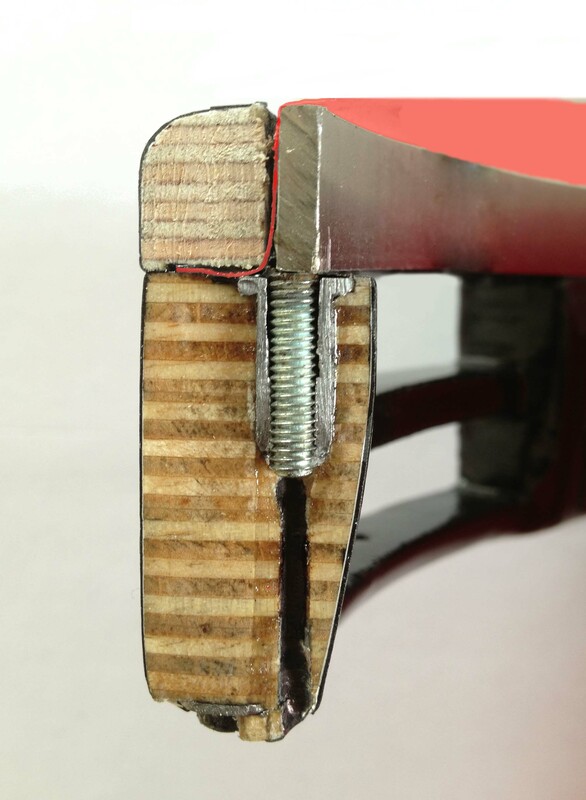 To reduce height, there is no wood between the upper jingle slot and the skin ring. The jingles are closer to the skin. As the jingle slot is open towards the skin ring on this model, the screws that hold the skin are not evenly distributed around the hoop and the skins are therefore not interchangeable with those of the moder classic model. The tuning system on all titus-riqs drums is basically the well known "upward pushing" type: the skin is stretched over a separate tuning ring and attached to the main body of the drum. The tuning ring is pushed away from the main body against the skin to tune it up. 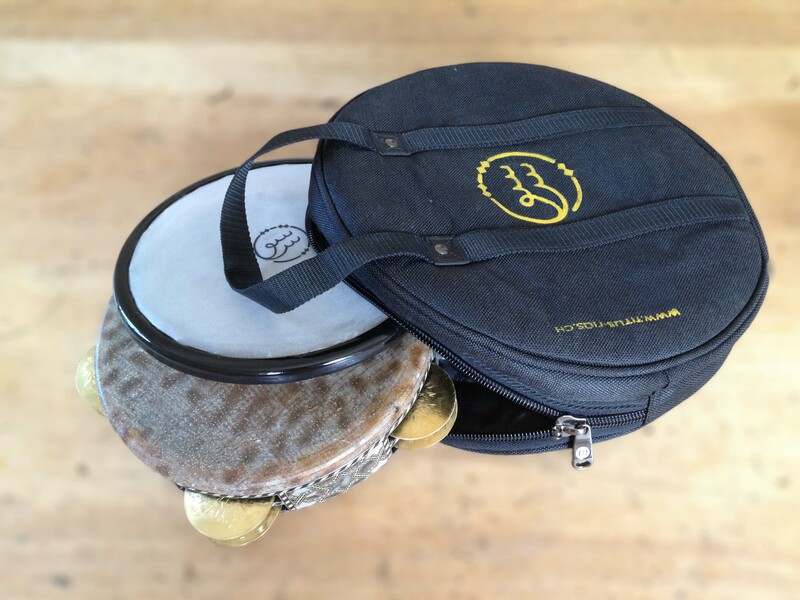 One huge benefit of such systems is that the skin runs over the tuning edge much in the same way it does on traditional non-tunable drums thus offering sound characteristics similar to these drums. On the downside you have the sharp edge that can make playing uncomfortable on the hands. But rounding the edge would change the sound considerably. 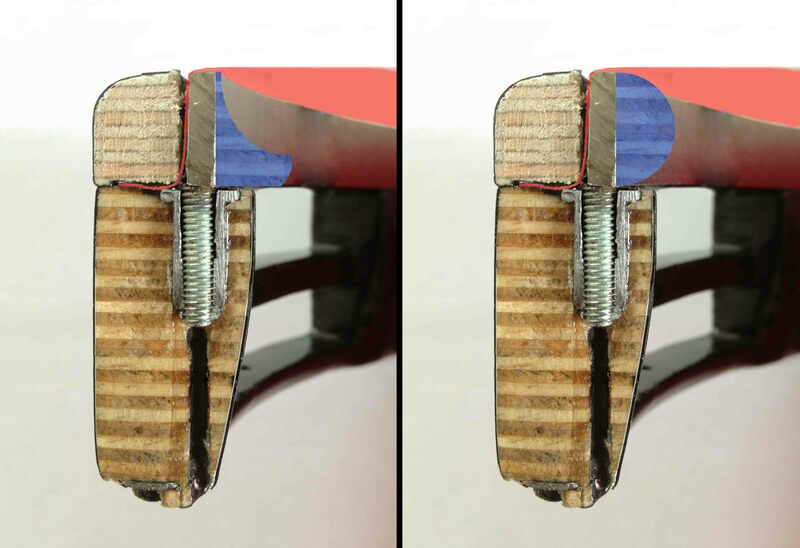 Here is the benefit of attaching the skin into a ring (the "flesh hoop") whose profile can be shaped to make the grip very comfortable without loosing the dry crisp sound of the sharp angled bearing edge. On the new modern classic models this ring is mounted in a way that allows it to be changed quite easily – so for the first time you can actually get a riq with an upward pushing tuning system and still change the heads yourself (or replace a broken skin without sending the drum in). The choice of 10 tuning screws was a very obvious one because not only is the tuning more precise like this, it also allows for screws with a smaller profile as the pressure is divided over more screws which also reduces strain on the frame in these places. With natural heads (like the classic fish skin) this tuning system provides the benefit of control over irregular shrinking and stretch of the skin due to humidity changes - a skin expands with increasing humidity and shrinks when it dries up, but unfortunately not uniformly but in relation to the direction of its fibres and varying thicknesses. So a fish or goat skin on your riq can sound nice in tune one moment and quite inharmonically soon after because of changeing weather. Here it comes in handy to have many tuning points around the instrument so you can even out the tension and get the instrument to sound clean again. 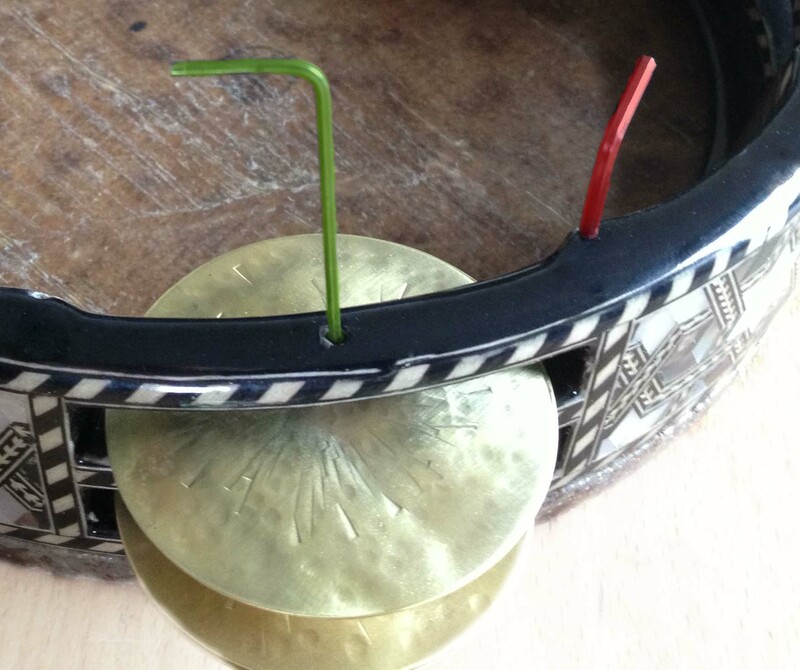 The tuning ring itself is rolled from 3 mm x 12 mm steel. The ends are then welded and the edge gets slightly rounded so the skins move over it easily. The inside of the tuning ring is finished matchingly with the rest of the instrument. 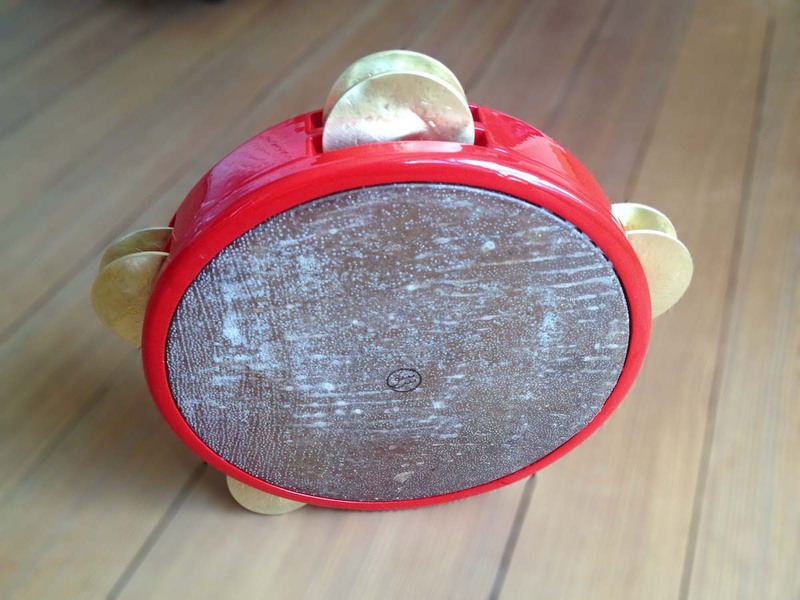 As an extra option a beveled wooden insert can be added to the inside of the ring acting as a sound guide that slightly shapes the overtones (see below). On the shallow frames it also serves as buffer stop to the jingles as there is otherwise no frame above the upper jingles on these drums. My jingles start as flat brass blanks. 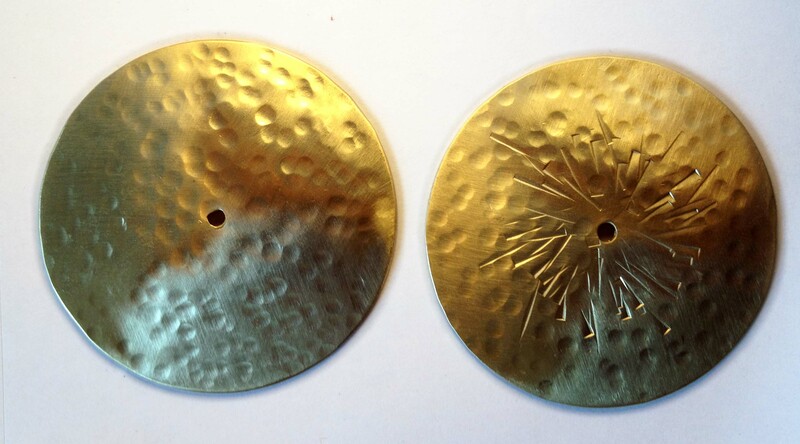 A 3mm hole is then punched in the center and each jingle is hand hammered in to consistent shape with hammers of various shape, size and mass depending on what sound colour is desired. All jingle pairs can be removed and changed individually by removing the hex screw that secures the jingle pin using the 1.5mm key that comes with each drum. The screws run in a brass threaded insert to ensure long-lived operability. Mother of pearl inlays are the classic finish on riq drums. Unfortunately most maufacturers of modern professional tunable riqs don't offer these labour intensive decorations. The inlays on Titus Riqs are made from real mother of pearl, assembled and glued by hand, sanded smooth and covered with several layers of sweat and tear resistant coating. Two degrees of luxury are possible: the most intricate inlay option uses interweaving wooden marquetry strips to fill the space between the mother of pearl shapes. 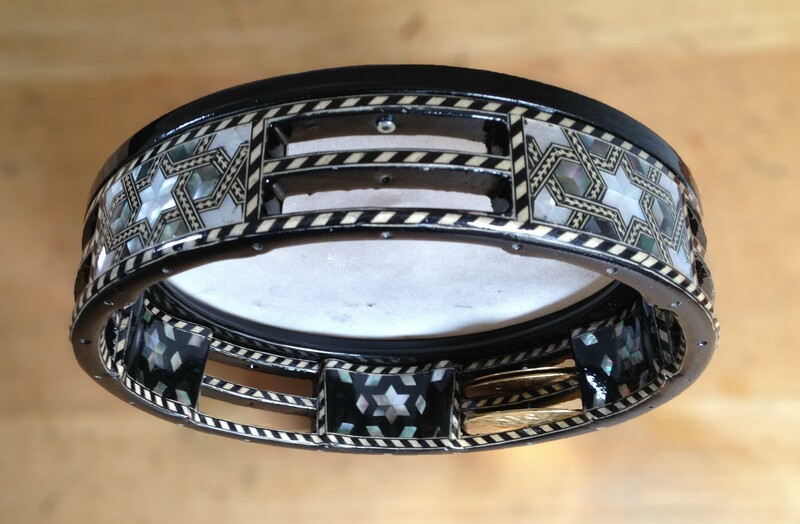 the more simple "light" decoration uses a black filler between the mother of pearl shapes resulting in a very classy look for a slightly reduced price. The inside of both types is done without strips due to the more irregular surface. The coating can be done high gloss or silk gloss or anything in between. The high gloss finish feels slightly more tacky whereas the silk gloss feels slightly harder due to it's higher content of solids. A silk gloss finish let's the inlays be seen under stage lights a little better as well. If you don't care much for inlaid finishes but still want a Titus Riq, there's a choice of 3 standard solid colour finishes: swedish blue (RAL3020), fire engine red (RAL5010) and jet black (RAL9005). All solid colours are high gloss. The clear coats on the inlays and the solid colours are all high quality urethane lacquers (2K) that are water dillutable (no toxic solvents are used in spraying). The finishes are non-toxic (according with EN 71 / 3 norm for toys) and highly resistand to most chemicals - as well as hand sweat of course. heads - click for larger views and details hear the effect of a 50mm dot on the underside. Same drum same tuning, same mic (Zoom H4n) before and after dot has been applied. 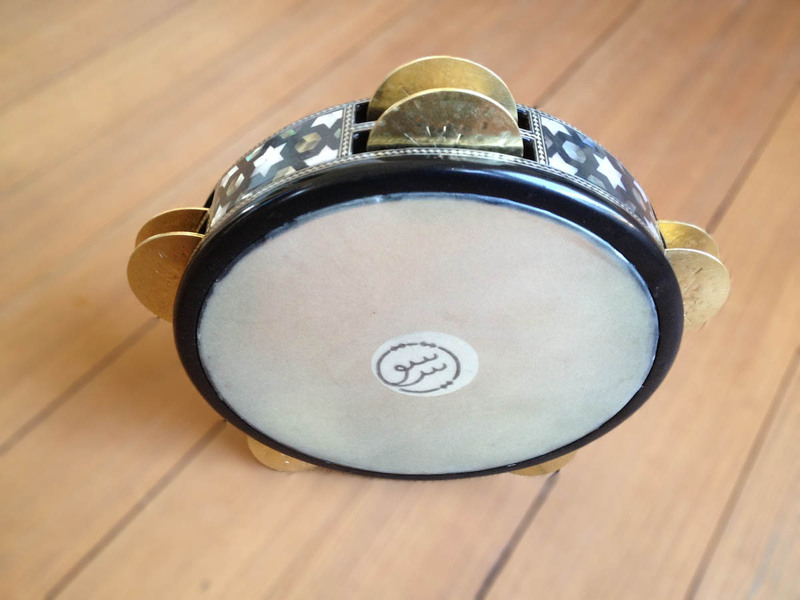 renaissance – the renaissance heads were designed as "artificial calfskin" and became very popular on hand drums. On Titus Riqs they are the more mellow sounding plastic skin. 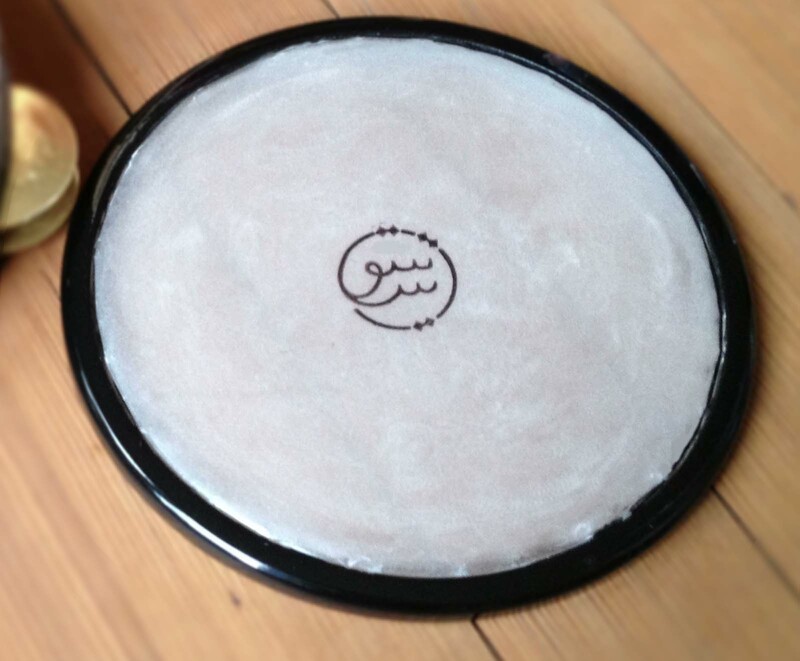 smooth white – a widely used choice in the middle east. Slightly more heavy in feel and brighter in sound. textured clear – a thinner mylar film whose surface is textured for a more "natural" touch than on the smooth white head. The sound is quite focused, falls between the other two plastic heads. all plastic heads can be fitted with a dot on the underside – this considerably lowers the fundamental frequency (heard in the "doums") without sacrificing the sharpnes in the "teks". fish skin is available as an extra option. Currently adds 30€ to the cost of the drum. Fish skins are either catfish or ray. All fish skins are thoroughly cleaned (no smelly fish jerky is left on the insides!) and the outsides are sanded down on spiky ones. 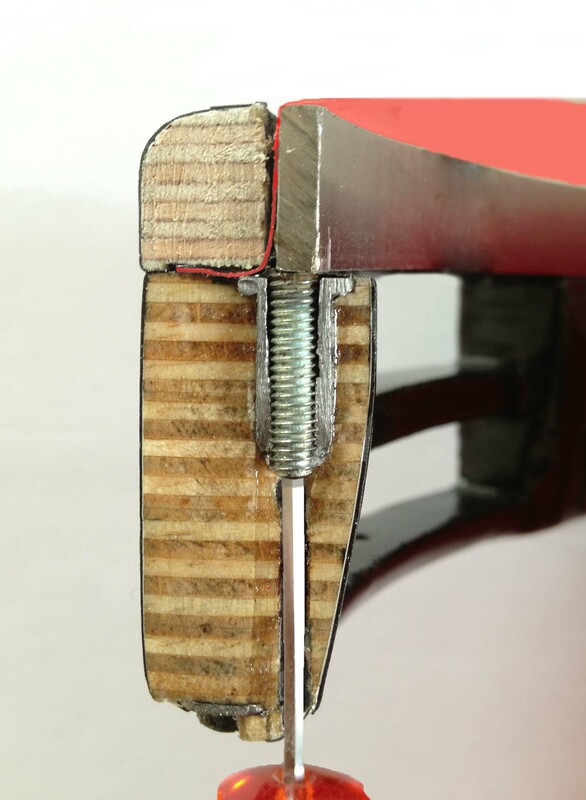 As an extra option a beveled wooden insert can be added to the inside of the tuning ring acting as a sound guide that slightly shapes the overtones. On the shallow frames it also serves as buffer stop to the jingles as there is otherwise no frame above the upper jingles on these drums. 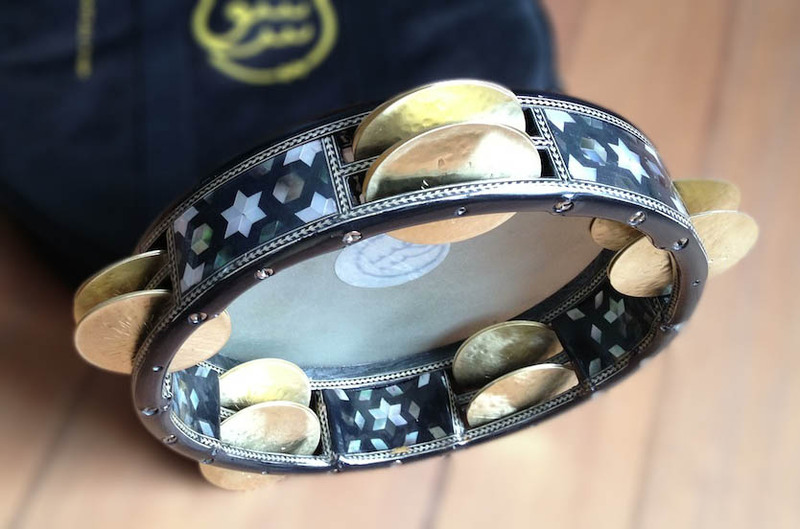 All traditional riqs from egypt come with a convex bevel – the reinforcement ring on top is usually rounded on the inside, resulting in a very gentle slope of the bearing edge away from the head. 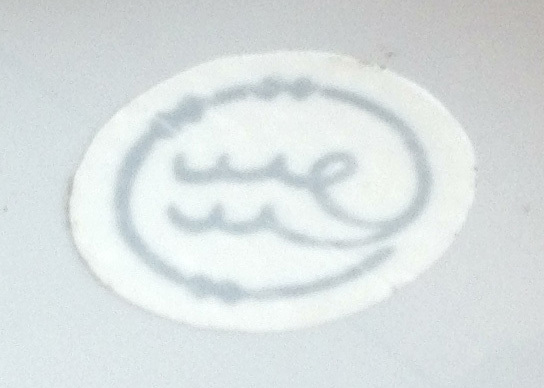 Another possible shape is concave – the overtones the skin produces at the edge are reflected upwards. This results in a very slightly different sound spectrum. 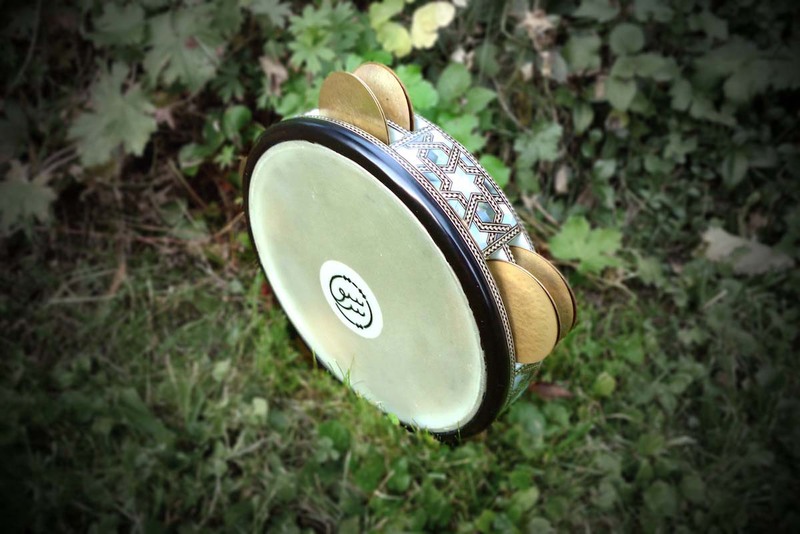 Currently adds 40€ to the cost of the drum. every Titus Riq comes with a padded bag. The Titus Riqs logo is silk screened onto one side. Custom decorations can be done (see facebook page). But for any non-standard options a surcharge will be billed, so please contact me about your dream riq. no jingles: you want other jingles on a Titus Riq? Really?! Well, saves you 70€... no guarantee that your jingles will fit the openings as my jingles are only 58mm diameter. 60mm jingles only fit if the hole is centered and not larger than 3mm. the riqs are shipped in the bag with additional padding. The jingles are removed for shipping to avoid damage due to leverage. The parcel with one riq is below 2kg - you can calculate shipping costs to your place here - just check the prices in the below-2kg-category, there are several levels of speed/urgency, so you can save by selecting a slower delivery. import taxes may be imposed by your country, they are out of my control. 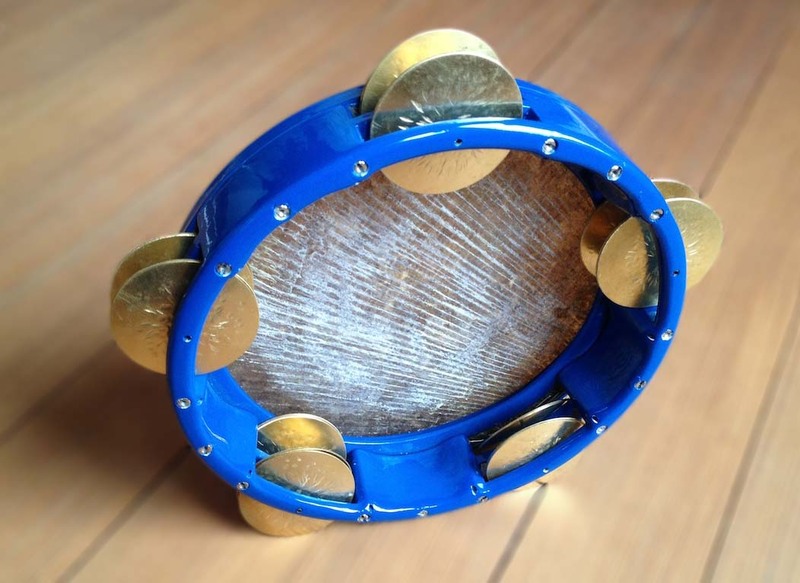 I think Titus Riqs are a great instrument and would love for you to be able to afford it. But of course when I spend hours and hours in the workshop making drums I am not working elsewhere where I would earn a wage. Still I work at a very low rate in order to keep prices lower.